This loaf of cinnamon sugar bread almost never came to be, which would have been quite unfortunate, because it was a thing of perfection, with a crunchy top and soft interior laced with more than a mere hint of cinnamon sugar. The first time I tried the recipe, the top wasn’t crunchy, and the interior was a wet, soupy messy of cinnamon sugar and raw batter. It fell apart coming out of the loaf pan, and I had to cut it into pieces before bringing it to the office to save myself the embarrassment of co-workers trying to cut/scoop servings for themselves. The concoction’s only saving grace? It was, beneath the disfigured clumps and raw batter, utterly delicious. The original recipe called for all of the cinnamon sugar mixture (a full 1/3 cup of sugar and 2 teaspoons of cinnamon) to be sprinkled in one layer on top of half of the batter, then topped with the rest of the batter. The cinnamon sugar mixture seems to have liquefied and prevented the batter immediately surrounding it from baking completely. I decided to give the recipe one more chance, figuring that if I could make smaller layers of cinnamon sugar, maybe the batter would have a chance to cook more evenly. I didn’t get the chance until this weekend, when I babysat my nieces while my sister-in-law had a much-deserved girls weekend out. Given my ineffective Barbie doll skills (the girls got pretty upset when I couldn’t remember the names of the dozen dolls NOT named Barbie) and the cold weather preventing us from easily pursuing outdoor, more tomboyish activities, I decided that a baking project was in order. Part of the reason I wanted this recipe to work was its ease of preparation: You literally stir seven ingredients together for the batter and then layer it in the loaf pan with cinnamon sugar. No mixer. No sifting. No melting. After having my charges stir the batter and shake the cinnamon sugar mixture together thoroughly, I poured what I figured to be about a third of the batter into the bottom of the greased and floured pan. I then had my nieces spoon about a third of the cinnamon sugar over the batter. I added another layer of batter, then almost all of the cinnamon sugar save for about 2 tablespoons. I added the rest of the batter, then sprinkled on the rest of the cinnamon sugar. 50 minutes in the oven plus 10 minutes on the wire rack and the loaf slid right out of the pan. After allowing the bread to cool for about 20 more minutes while watching Scooby-Doo (the 2002 live-action version), we had cinnamon bread and hot chocolate out of my childhood Tupperware tea set (now theirs). The original recipe came from A Whisk and a Prayer via Pinterest. Preheat oven to 350 degrees. Lightly grease a 9×5-inch inch loaf pan (I also cut a piece of parchment paper to fit on the bottom for extra non-stick protection). Stir the cinnamon and 1/3 cup sugar together. In a large bowl, combine flour, baking powder, salt and 1 cup sugar. Add the egg, milk and oil. Stir until just moistened. Pour approximately a third of the batter into the loaf pan. Sprinkle with about a third of the cinnamon sugar. 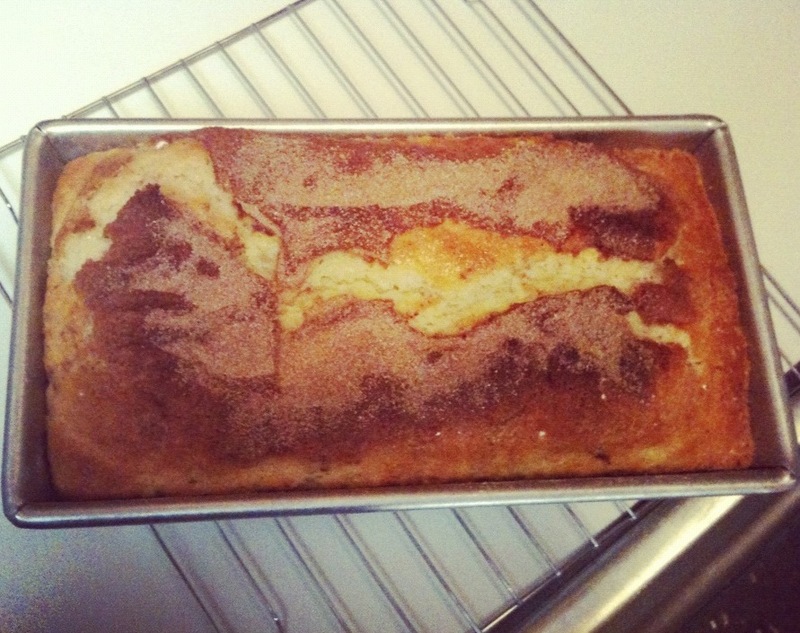 Top with another third of the batter, then almost all of the remaining cinnamon sugar. Pour the rest of the batter in the pan and sprinkle the rest of the cinnamon sugar on top. Bake in preheated oven for 45 to 50 minutes, or until a toothpick inserted into center of the loaf comes out clean. Let the bread cool in the pan for 10 minutes before removing it to a wire rack to cool completely. The original recipe advises you to wrap the loaf in foil and let it sit overnight before slicing. If you can endure the scent of freshly baked cinnamon bread wafting through your home without cutting a piece off until the next day, then go for it. If not, enjoy your snack today AND tomorrow.